If you are considering any EHR software, this is the “must-see alternative” before you buy. “Eye care professionals risk buying the perfect computer system for last decade’s needs – computer systems that merely ‘record the business’ and automate paperwork. The world has changed. Health care is transforming. Retail is more problematic, and acquiring and retaining patients more challenging. From horses to horsepower, transportation has evolved. From rotary phones to smart phones, communications have transformed. From paper records to electronic records, health care is transforming too. But even certified EHRs are not created equal. Some are rooted in the past. Others are focused on the future. Backward-looking EHRs simply record and report. They move paper to computers. Forward-looking EHRs are smart. They embed thoughtflow. They think like you do. They optimize your work, your business, your speed to success. Health care is transforming. Big and safe, cheap and easy will slow you down. Only the completely different will speed you up. Speed to success is everything. 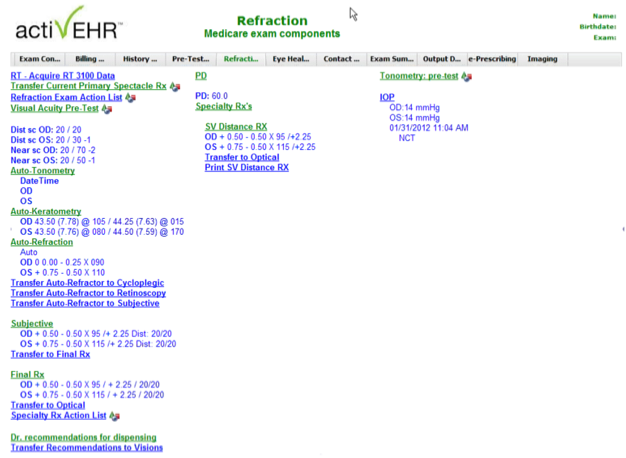 EHRs can easily display too much information! activEHR shows you only relevant information, what you most need to know, right now, right at the point of care. Clinical Decision Support is a good example. activEHR shows you that a drug prescribed by another provider has ocular side effects. That's relevant information! "It's important to have the mechanics of the software feel and look comfortable … but it's also about which software will be able to handle the challenges of the changing landscape and afford me the best security in the health care model of the future. No one else is talking like EMRlogic; these are the thought leaders in our profession." Traditional EHRs record your results. New-generation EHRs drive your results. This is #1and it’s an old-style PreTest screen. Look at all those data fields waiting to be filled. Point. Click. Select. Click. Type. Click. Click. Click. 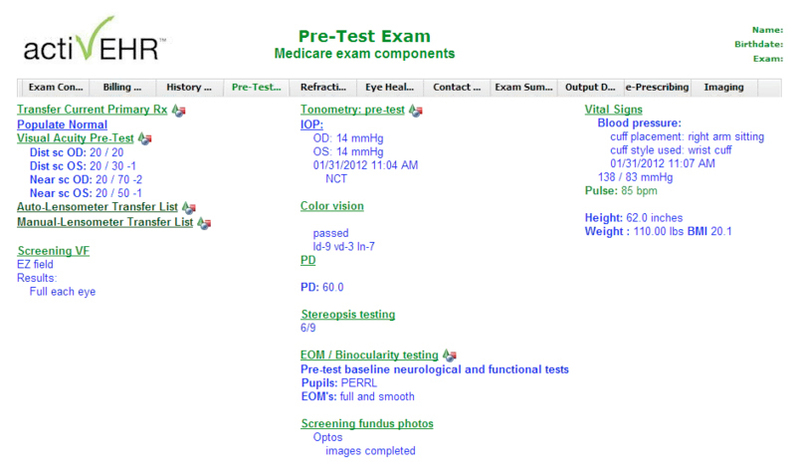 This is #2 and it’s a PreTest screen from our new EHR. Numeric data is transferred in from linked instruments. Relevant information is brought in from our knowledge base of eye care best practices. "I have never seen anything like the white-page approach in these EHRs or the knowledgebase that underlies them. The level of sophistication for medical eye care is unparalleled." This is #3 and it’s a traditional-style Eye Health screen. How can you spot these slow-you-down systems? 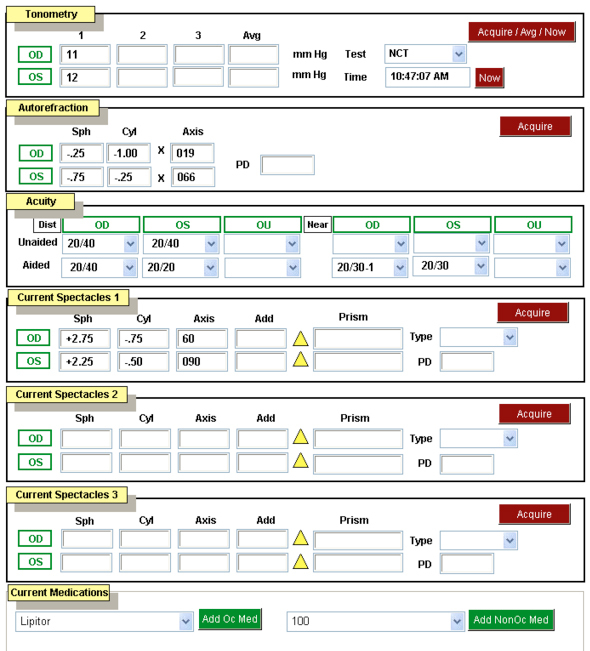 The fill-in-the-blank screens are typical of early EMR applications. Point. Click. Type. Click. Type. Click. Click. Click. 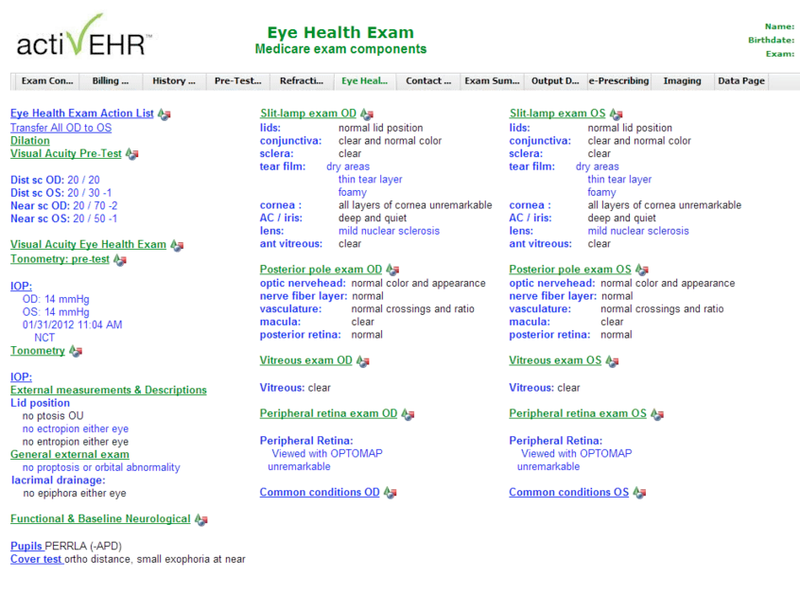 This is #4 and it’s an Eye Health screen from our new EHR. Relevant information only. You've seen some software screenshots. Now see the software live. See what more clients are saying about us. "At Nittany Eye, we have been a customer of EMRlogic since January 2007. Now that we have activEHR, it feels like this is the software we’ve been waiting for these past five years. The certified product is exactly what our profession needs – unique and robust EHRs that can raise the bar for medical optometry and play ball in the big arena of health care and health information exchanges. 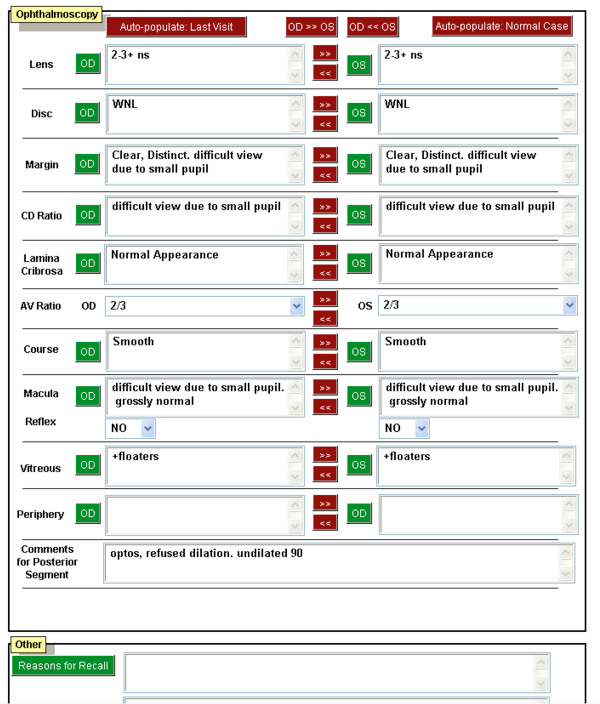 “In my recent software search, I looked extensively at a variety of systems. I evaluated the big names and some smaller alternatives. In speaking with the folks at EMRlogic, I encountered something unique – a different way of seeing the future of eye care. And without question, their vision shows up in the software. I have never seen anything like the white-page approach in these EHRs or the knowledgebase that underlies them. The level of sophistication for medical eye care is unparalleled. I can say that this company took me to a whole new level in thinking about the future of my practice and my business. Where I started out concerning myself with cost and screen presentation, I quickly realized I was not skating to where the puck was going. But EMRlogic was doing just that. While it is important to have the mechanics of the software feel and look comfortable - and EMRlogic has done that – it’s much more about the big picture of health care reform. It’s more about which software will be able to handle the challenges of the changing landscape in healthcare and affords me the best security in the health care model of the future. No one else is talking like EMRlogic; these are the thought leaders in our profession. I fully expect activEHR is going to change not only my practice but eye care throughout our profession. For those who are interested in an innovative, cost-effective and intuitive design to their EHR, I say look no further than EMRlogic." — Space Center Eye Associates, Houston, TX. “It was 2003 and my DOS software was no longer doing the job. 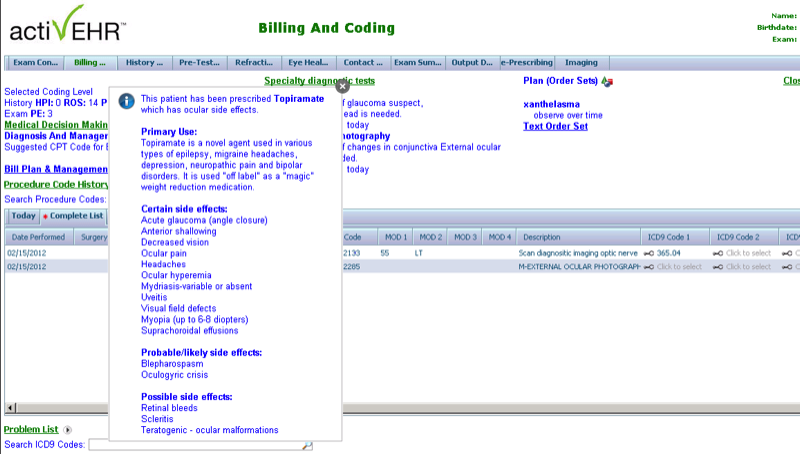 I did an online demo of OD Professional and immediately saw the future of electronic medical records. The transition from DOS to Windows was difficult but we got through that. During the change period, I needed to be a leader for my staff not just an adopter of the software. EMRlogic has grown tremendously and OD Professional has morphed into activEHR. I’m very proud to have been part of a team of optometrists, led by an EMRlogic staff doctor, that has put its mark on these new medical records. activEHR is unique. That future I saw in 2003 is now. “A software upgrade is a culture change in business not simply digitizing our old, comfortable ways. Unlike my previous software that allowed me ‘open flexibility’, activEHR is causing us to run a tighter ship. Action Manager keeps us on focus, not letting things fall through the cracks. Recommending software is like recommending a restaurant or a hotel; it is personal. However, I will say that I am continually impressed with EMRlogic. I trust the foundational principles of this company, as well as their dedication to stay abreast of technological and marketplace changes."